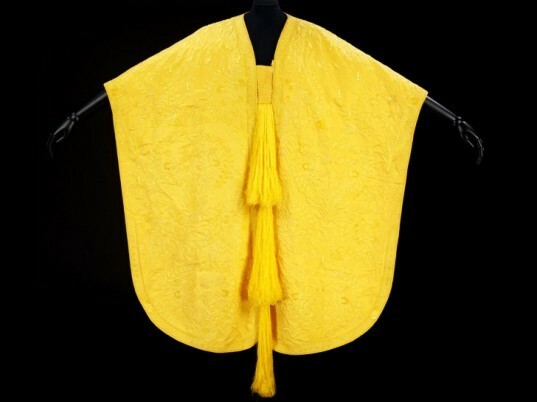 We couldn’t believe our eyes when we saw this glistening yellow cape made from spider silk. The un-dyed, untreated garment is the world’s largest piece of clothing made entirely from the durable natural material. Now on public display at the Victoria & Albert Museum in London, the textile accredits its unearthly glow to the lady golden orb spider. We couldn't believe our eyes when we saw this glistening yellow cape made from spider silk. The un-dyed, untreated garment is the world’s largest piece of clothing made entirely from the durable natural material. Now on public display at the Victoria & Albert Museum in London, the textile accredits its unearthly glow to the lady golden orb spider.